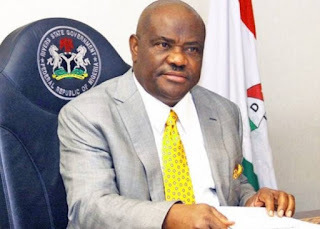 Governor Nyesom Wike of Rivers State has condemned the siege on the National Assembly by security forces, urging Nigerians to rise up against the growing dictatorship of the All Progressives Congress (APC)-led Federal Government. Governor Wike, on Tuesday, declared that the assault on the National Assembly by security agencies ordered allegedly by the Federal Government, was condemnable and has the capacity to truncate the nation’s democracy. According to the governor, “All well-meaning Nigerians should stand up against this dictatorship. All over the world, this has never happen. “Nigerians should not stand aloof and watch what is going on. This will consume so many people if we don’t rise against it”. Governor Wike called on National Assembly members to stand firm in defence of the nation’s democracy. “All members of the National Assembly should resist that anti-democratic attempt and stand-up to defend our democracy“. The governor berated his colleagues who are happy with the anti-democratic plots of the APC Federal Government. “Those governors happy with what is happening today, should know that it will be their turn tomorrow. The same cabal will turn against these governors. “This is condemnable and unacceptable to us. You must follow laid down rules. You cannot talk about fighting corruption and refuse to respect the rule of law”, he said.